It’s really important to exercise and stay physically active as you get older. Exercise and physical activity can help you to stay energetic, healthy, and more independent in later life, and here’s why. According to the NHS, there’s strong evidence that people who are active have a lower risk of heart disease, stroke, type 2 diabetes, some cancers, obesity, arthritis, depression, and dementia. More than that, exercise is also good for your mental wellbeing. It releases endorphins also known as “happy chemicals” that can significantly decrease the symptoms of depression. In turn, this can help relieve stress, increase self-esteem, and help you relax. If the benefits are undoubtedly significant and have the potential to extend life, why aren’t more people placing an emphasis upon this and including exercise as part of their everyday life?! To answer this question, we first need to understand what some of the obstacles might be which prevent people from adopting a more active lifestyle. At LRG Fitness our objective was to better understand why older adults fail to exercise and what we can do to help motivate and encourage this growing demographic. Many of the findings were similar to that of younger people, such as feeling self-conscious; they were time impoverished; there was a lack of support; they had limited knowledge of equipment; they experienced a lack of confidence; a fear of failure and a lack of motivation. Once armed with this knowledge, it became clear that when developing a programme designed to help address these issues, it had to be based around sensitivity and compassion, yet with an element of light heartedness! 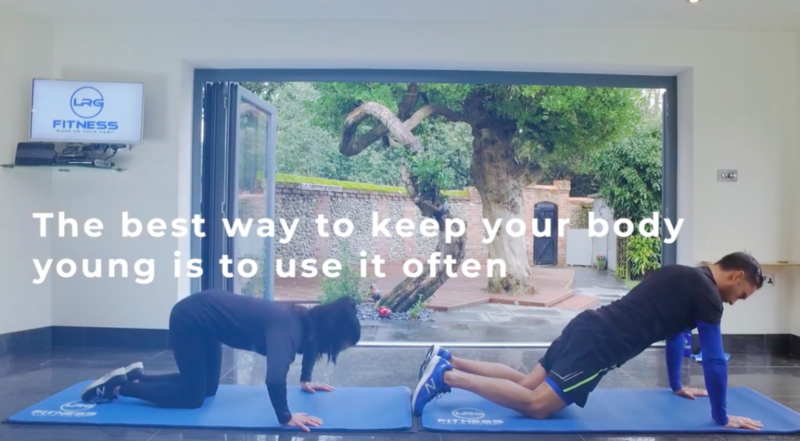 Performed in the comfort and sanctuary of your own home, our 12 – week online exercise programme helps to address these concerns; specifically around the lack of time available and the feeling of self-consciousness. You can follow our workouts at a time that fits around your schedule and in clothes that you feel most comfortable wearing. Virtually personal trained throughout, with a focus on form and technique, which can help with low confidence and motivation. Incorporating low impact and moderate exercises, with entry level options for every exercise, ensures we remove the fear of failure barrier. From your 40’s onwards you begin to lose muscle mass, which means you burn fewer calories. Muscle strength is especially important for bone health, balance and just being strong enough for daily activities such as climbing stairs or carrying shopping. The addition of our strength and conditioning workouts with our resistance bands and loop band workouts will help build muscle mass, strength, and endurance. We offer a direct line of communication with our members and provide the necessary equipment as part of the programme, this can help those members who feel they have limited knowledge and support. As a husband and wife team, our demeanour and on-screen presence is guaranteed to offer you a degree of light heartedness, although not always intentionally! So, whether you’re considering beginning a path to fitness or seeking an additional programme to help support and enhance your existing regime, consider signing up to our 12-week online exercise programme. Everyone, no matter what age, should take on some form of exercise and resistance training, have good nutrition, and quality sleep. Start early to stay young and resilient forever.